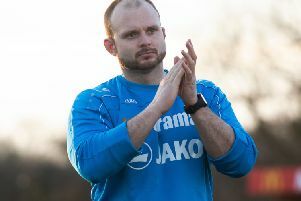 Hemel Town boss Dean Brennan envisages an entertaining clash at Whitehawk on Saturday as two of the best attacking sides in the National League South go head-to-head. Both teams will be eager to return to winning ways following some indifferent form in their last few league fixtures, and Brennan knows his side are in for a stern test on the south coast. “It will be a great challenge for us on Saturday against Whitehawk,” he said. “I know that they haven’t played a lot of games lately, but they are one of the best sides in the division, if not the best footballing side, along with ourselves. “It should be a good game of football – we had two very entertaining games against them last season and they have got some fantastic attacking players. “Kingy (Whitehawk manager Steve King) is one of my old managers and his teams always play good football. They play a flamboyant 4-4-2 style with quick, creative wingers so it should be a good game. We’ve just got to try to build some momentum and it’s important that we go to Whitehawk and don’t get beaten. Hemel are still competing against an extensive injury list, with three of the first-choice back four unavailable for Saturday, and Brennan admits that this had given him a real headache in terms of team selection. “We are still struggling with injuries in the defensive position, and any team builds their success around their back four and their midfield; that’s the spine of the team,” he said. “You can change the front four and they will go in and out of form, but you need your goalkeeper, your back four and your defensive midfielder player to play week-in, week out. “The fact that we are 10th in the division and not in a relegation battle is a real bonus for me because I’ve never known so many injuries to key players. “We’ve just got to get on with it because it has been a great test for us this year, both as a management team and as a football club. You can’t let your guard down in football, because if you do you will get punished. “We’ve just got to keep going one game at a time, try to build some momentum and it’s important that we go to Whitehawk and don’t get beaten. “I’m not sure what the team will be yet – I’d usually know roughly by now but I’m not sure yet because of the injury situation. Hemel will be without Adam Bailey-Dennis, Louis John, Ed Asafu-Adjaye, Kyle Connolly, Matt Spring or Nikolay Todorov for Saturday’s trip to The Enclosed Ground.